Lingusamy who has rocked the audience with his racy way of storytelling has once again won the race through Vettai starring Madhavan, Arya, Sameera Reddy, Amala Paul in the lead roles. His last release is Paiyaa with Karthi and Tamanna in the lead roles. The film went on to become a big hit, that recently the Hindi remake rights are bought by a leading producer. The film is about two brothers Thirumurthi(Madhavan) and Gurumurthi(Arya) who share a great bond right from childhood with a police family background in Thoothukudi. While Thiru is a innocent boy who grows up in the same way whereas Guru is the exact opposite, He is bold and ready to clash with anyone that comes in his brother's way. They grow up in the same manner till the later days too. On the other side it is Vasanthi(Sameera Reddy) and Jayanthi(Amala Paul) who are born as sisters who remains naughty at all times. At one point these two brothers and sisters clash each other at funny circumstances and love blossoms between them. There enters the Villian Ashutosh Rana and his gang who threatens the people of thoothukudi in every manner. At this point Thiru was given the responsibility to become the next Police officer on the lines of his father and grandfather. When the whole police department which includes Naseer and Thambi Ramaiah in special roles who are expecting Thiru to be a strict and bold person, they soon find out that he is fearful and calm natured. Thirumurthi ties knot with Vasanthi at one point but troubles follow them so, Arya comes with a plan to switch sides without anyone's notice. Soon the Villian group finds out this and smashes Guru at one stage. Now it is upto Thiru whether to become strong or stay weak which forms the rest of the climax. Lingusamy has yet once again proved that he is a director who can give a high action oriented film with full of Commercial values like his earlier ventures, especially adding a Mass scene of Ajith's Mankatha at the right place. 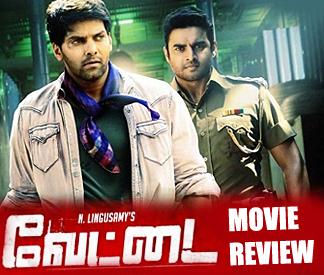 Madhavan as the innocent brother and police officer steals the show with his screen presence with Sameera Reddy, whereas Arya as the angry young man gives an high action entertainment to the audience. Amala Paul with her cute looks and romance turns up your body heat. Also Naseer and Thambi Ramaiah has did their roles with perfection. Ashutosh Rana and Muthukumar the one who was seen as the elder brother of Nani in Veppam remains as the same gangsters of action films. Raja Sundaram appears in a cameo role and does his part well. Nirav Shah has scored big time with his Cinematography with rich visuals remains as the backbone of the film's narration. Music by Yuvan Shankar Raja has been a highlight with rocking Bgms all over. While Editing by Antony gives a racy and crisp feel to the viewers. Even though the film carries 5 songs, the film maintains the tempo till the end. Madhavan's comeback will be Vettai for sure. The charming actor who was missing in Tamil cinema's for a long period of time is back with a bang. Arya as the brother of Madhavan suits the character without any flaws and shares equal importance. Sameera Reddy and Amala Paul fill glamour to this high end action film.